Planes, Helicopters, Drones, Boats, Monster Trucks, Rock Crawlers, Scale Cars, Tanks, in petrol, nitro and electric from leading manufactures including HPI Racing UK, FTX, Maverick, Hobao, Top Flight, Hubsan, Nine Eagles, UDI, Traxxas, Rally Legends, Heng Long, Vortex, Revell, Carrera and Syma. The Radio Control, Centre is run by Tom and Peter. They have a wealth of knowledge and experience and offer a full repair service. We are an authorised HPI Racing UK Repair and Help Centre. There is an extensive range of spares, accessories and fuel. Their advice is free! The massively popular HPI Bullet ST/Bullet MT 3.0 has been updated with an all-new look, and this super tough off-road fun machine is ready for action at your command! 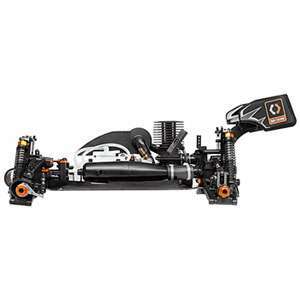 The Bullet 3.0 can blast through any type of terrain thanks to the immense power of its HPI Nitro Star G3.0 engine and a durable 4WD drivetrain. Getting to awesome speeds and catching massive air has never been more fun! The durable, robust design of the Bullet means it can take hard landings and rough action so you can enjoy big air, hard-hitting action whenever and wherever you want! The Bullet features a low, aerodynamic body with racing number plates and a rear spoiler for extra downforce. The truck bed even has an angled cover to decrease drag and direct air over the spoiler. The paint scheme is an all-new design of black, silver and orange and combined with street-style 5-spoke black chrome wheels for a stunning overall look! The styling of the front end is enhanced by the classic pick-up truck look of the grille and headlights, and the hood bulges enhance the powerful look of the Bullet. The front and rear bumpers and window details including roll bars and window nets all enhance the racing truck looks, which is finished off with low-profile studded tires wrapped around shiny black chrome wheels. The Bullet 3.0 trucks feature a protected receiver compartment for the truck’s battery pack and receiver, plus waterproof steering and throttle servos that allow you to keep running your Bullet in extreme conditions that would kill just about any other vehicle! Want to tackle that muddy bog? How about that stream crossing? A bit of rain about to fall? It’s all good for the Bullet trucks! Please note: This HPI vehicle is designed to provide water protection so it can be driven in wet conditions (e.g. rain, snow, puddles). Not for submersion. See manual for details. Formed from 6061 aluminium for a combination of strength and light weight, the Bullet 3.0 chassis is durable and looks great! Thick sheet aluminium is stamped into shape to form the ideal backbone for all the various components that make the Bullet trucks so tough! The front kick-up provides extra control at all speeds, essential for a go-anywhere, do-anything vehicle like the Bullet. The sides are also bent upwards to give extra ground clearance in tight turns, but also vastly increased longitudinal stiffness – perfect for all your off-road adventures! The Bullet 3.0 is packed with features, with every component placed exactly where it needs to be to operate in the most efficient way possible. The steering servo is placed in a “laydown” configuration for a low centre of gravity, and the weight of the engine fuel tank balances the electronics on the other side of the chassis. Derived from decades of HPI Racing experience, the Bullet takes advantage of our design team’s knowledge to give you a perfectly balanced, compact and easily maintained nitro stadium truck! A strong plastic spur gear takes the power from the engine and transmits it front and rear through an adjustable dual pad slipper clutch. The centre dogbones drive the front and rear bevel differentials, which use 4 internal gears for increased durability and lifetime over weaker 2-gear diffs. Braking power is provided by the adjustable steel disc brake for maximum stopping strength to all four tires! Extra-tough hardware is a major feature of the Bullet trucks, and it’s no different when you look at the driveshafts. Super strong coated steel dogbones transfer the power from the front and rear differentials into the wheels. On each axle is a standard-size 14mm hex adapters using nylon, and a sturdy steel locknut holds the wheels on place on each axle. The waterproof HPI SF-10W servo pulls double duty on the Bullet 3.0, with one SF-10W easily handling the steering of the front wheels and another SF-10W controlling the carburettor and brake positions. The HPI SF-10W servo is a powerful and reliable unit, and thanks to a strong spring-loaded servo saver it can take the hits of jumps and crashes as you drive all day long. It’s also completely waterproof so it can take the abuse of all-terrain truck action! The Nitro Star G3.0 engine provides all the muscle for the Bullet 3.0 nitro trucks – it’s loud, powerful and strong, to give you amazing acceleration and awesome top speed! The engine is started by a simple pullstarter system and is protected by a unique water splash cover and 2-stage air filter for extra protection. The two-needle carburetor allows you to fine-tune the performance of the engine for any conditions. With nitro power at your fingertip, you can have fun all day long, only stopping to refuel! The HPI Savage is legendary as the most durable monster truck ever, and now it’s packed with even more features! The monster truck that broke new ground in durability, Big Block power, innovative design, and unrivaled performance is making sure the competition stays on their toes. It’s better equipped than ever, with better handling and an even better looking body. The updated Savage X 4.6 has it all! Four huge Big Bore shocks give the suspension action you need to get out and blast through the roughest of tracks or Off-Road terrain. The slick Nylon bodies are lightweight and strong, with almost no ‘stiction’ between the shock piston and shock body. The extra-large capacity gives you extra control and damping action so you have the driving feel that makes Off-Road driving so much fun! The RTR Savage X 4.6 has beefy suspension arms that can take the punishment of big-air drops and top speed runs over bumpy terrain. Keeping everything protected is the reinforced “X” TVP (Twin Vertical Plate) chassis, which features thick aluminium plates and custom ‘X’ graphics. Extra material was added to the skid plates and bumper to help the Savage X 4.6 survive huge jumps and crashes. The thick engine mount and engine plate give the truck amazing durability and endurance, especially when you’re landing massive jumps! The Savage X 4.6 is the most user-friendly Savage ever, allowing you to access all of the key areas with minimal disassembly. For example, the centre gearbox is split into four separate pieces to allow for access from the top without dissembling the TVP’s. Diff access is also easier than ever with no chassis removal required. No matter what part of the truck you are trying to access, it can all be done in record breaking time! The massive F4.6 Big Block engine is designed for one thing and one thing only – huge amounts of horsepower! Nearly 3hp, in fact! Enough horsepower to get the Savage X 4.6 to speeds over 45mph (73kph)! And Big Block TORQUE is always on tap, just pull the throttle and you’ll know you’re not driving a small block. You want speed? You want torque? You’ve got it! Rough off-road terrain and extreme stunts are not a problem with this engine! You get toughness as well as speed: the F4.6 features true ABC construction (Aluminium piston, Chrome-plated Brass sleeve), 8 port tuning, a 7.5mm composite carburettor, and a heavy duty triple shoe clutch. A dual-stage air filter protects the F4.6 from dust and dirt kicked up by the 4WD action! The RTR Savage X 4.6 includes an electric start system to get the engine running with minimal effort! To start your engine simply insert the starter unit into the engine’s back plate, pull the trigger and away you go! To power the starter unit, you need a standard 6-cell stick battery pack with normal RC charging plug, both of which are included. Our designers wanted to make sure the Savage X 4.6 drivetrain could handle the extra power of the Nitro Star F4.6. The Savage drivetrain features a permanent 4WD system and spins on rubber-sealed ball bearings. The proven 2 speed transmission uses tough metal gears for durability, and has adjustable shift points for the ultimate tuning. To add extra strength, aluminium alloy diff cases are standard on the front and rear differentials, pre-installed and shimmed to extend the maintenance interval of the HPI 4-gear differential. The adjustable slipper clutch features a durable slipper pad, so there’s less maintenance and more driving! Finally, to make sure you can stop this beast quickly, the Savage X 4.6 is equipped with a twin vented disk brake made from heat-resistant fibre material to give you more stopping power! 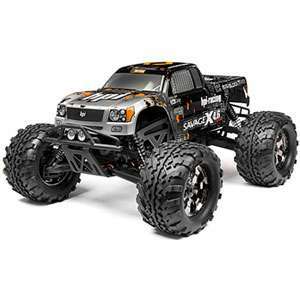 Head to any track and it’s easy to see the HPI Savage is the most popular monster truck around. With unrivalled backing in the form of toll-free HPI customer service, knowledgeable hobby shop staff, fanatical owners, outstanding online support, plus a huge racing scene, the Savage is not only the most popular big-block monster truck around, it’s the best supported! 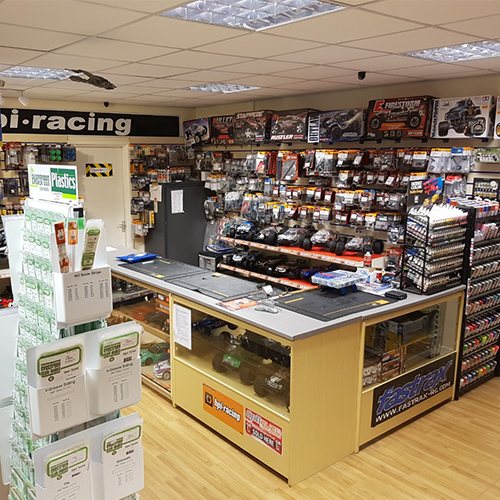 In addition to personal and friendly advice from tuners, racers and shop staff, a huge range of option parts are available from HPI and a massive assortment of other aftermarket manufacturers! Choose from anodized aluminium parts in a rainbow of colours, pure racing options like lowered chassis plates, big horsepower upgrades like giant engines, durability options to handle the extra power, functional add-ons like HPI’s illuminated battery level indicator, plus pure ‘bling’ bolt-ons like sweet custom chrome wheels and funky treaded tires! HPI makes it as easy as possible to get into RC Off-Road action. The Savage X 4.6 is completely pre-built and ready to go right out of the box! Everything is assembled and tuned for you by professionals – diffs, shocks, suspension and more are perfect before you even open the package. And with many of the top Savage options already installed, you don’t have to do a thing to get going fast! HPI Ready-To-Run vehicles bring you the same high performance and quality that you’d expect from a high end RC kit but with the added convenience of being factory pre-assembled to the highest standards – giving you a high performance RC truck straight from the box! The HPI Trophy range of off-road racers has been updated with the latest in 2.4GHz radio technology, waterproof servos and a waterproof receiver & battery compartment! That’s right: one of our most popular nitro kits ever now has been upgraded to make it a performer just about anywhere! In addition to being race-bred and ready for track action, the updated Trophy Truggy 4.6 looks great, too. The aerodynamic racing truck bodyshell features a brand new paint design, and the Shredder Block angle pin racing tyres are wrapped around cool black chrome Edge 7-spoke wheels. The rear wing isn’t just for looks, either – it gives the Trophy loads of downforce and control in the air. To top everything off, we’ve updated the anodizing of the shock caps, wheel nuts and more to HPI-spec bright orange! Want to tackle that muddy bug? How about that stream crossing? A bit of rain about to fall? That’s all fine for the Trophy! The awesome Nitro Star F4.6 engine from the legendary Savage 4.6 monster truck provides all the grunt needed to get the Trophy Truggy up to wild speeds – it’s extra-loud, super-powerful and mightily strong, so you’ll be able to rip off huge stunts like record-setting long jumps, backflips, tall jumps, even double backflips! The F4.6 engine will give you eye-opening acceleration and crazy top speeds! The engine is started by a simple pullstarter system and is protected by a unique water splash cover and 2-stage air filter for extra protection, and the two-needle carburettor allows you to fine-tune the performance for any kind of weather or fuel. HPI makes it as easy as possible to get into RC racing action. The RTR Trophy Truggy 4.6 is completely pre-built and ready to go right out of the box! Everything is assembled and tuned for you by professionals – diffs, shocks, suspension and more are perfect before you even open the package. You don’t have to do a thing to get going fast! Nitro Car Fuel, Fuel Bottle, Glow Plug Igniter, All included in a HPI Nitro Starter Pack includes almost everything you need! In addition to being race-bred and ready for track action, the updated Trophy 3.5 looks great, too. The sleek aerodynamic racing bodyshell features a brand new paint design, and the HB Proto tyres are wrapped around cool black chrome Edge 7-spoke wheels. The rear wing isn’t just for looks, either – it gives the Trophy loads of downforce and control in the air. To top everything off, we’ve updated the anodizing of the shock caps, wheel nuts and more to HPI-spec bright orange! The Nitro Star F3.5 V2 engine provides the grunt needed to get the Trophy 3.5 buggy up to wild speeds – it’s loud, it’s powerful and it’s strong, so you’ll be able to rip off huge stunts like record-setting long jumps, backflips, tall jumps, even double backflips! The F3.5 V2 engine is lighter and more energy-efficient than the V1 engine used in the first Trophy buggy, so you’ll get even BETTER acceleration and HIGHER top speeds! The engine is started by a simple pullstarter system and is protected by a unique water splash cover and 2-stage air filter for extra protection, and the two-needle carburretor allows you to fine-tune the performance for any kind of weather or fuel. One added benefit of the Nitro Star F3.5 is that it’s a race-legal .21-size engine, which means you can drop down to your local track or club and enter in a race as soon as you open the box! HPI makes it as easy as possible to get into RC racing action. The RTR Trophy 3.5 buggy is completely pre-built and ready to go right out of the box! Everything is assembled and tuned for you by professionals – diffs, shocks, suspension and more are perfect before you even open the package. You don’t have to do a thing to get going fast!